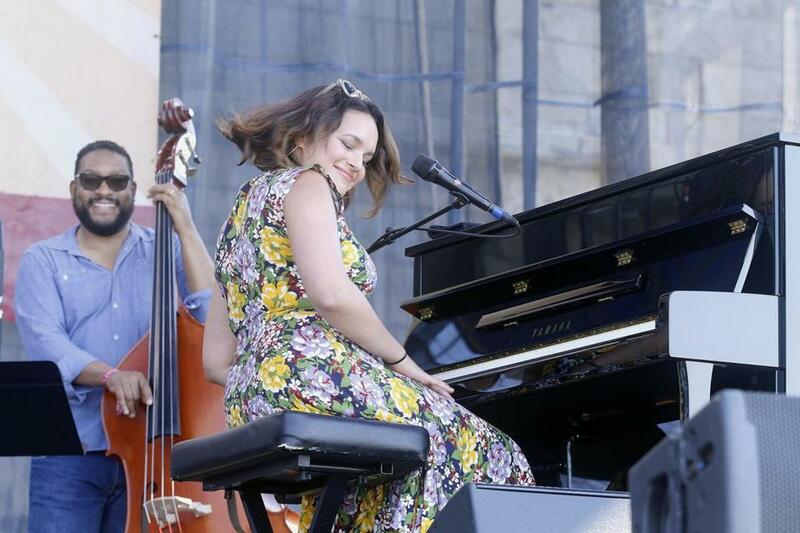 Norah Jones onstage at the Newport Jazz Festival Saturday. NEWPORT, R.I. — Norah Jones has a way of being there when you need her. She broke through five months after 9/11 — a warm, honeyed voice, right up against your ear, AutoTune-free and honest. Maybe for that reason she seemed especially right for the mainstage at the Newport Jazz Festival, in this annus horribilis of mass shootings and random acts of terror, capped by an election-year horror show. The most explicit reference to politics came from big band leader Darcy James Argue, whose Secret Society presented selections from his new “Real Enemies” suite, with section titles like “The Enemy Within” and “Trust No One,” and drop-in samples from JFK and other political figures. The music was a churn of overlapping cyclical rhythms, vivid colors, and bravura solos, with smatterings of rock and Latin grooves. When it was done, Argue more or less apologized for introducing paranoia to a beautiful summer day. Other stylistic variety: the “retro-futurist” abandon of New Orleans pianist Henry Butler and New York trumpeter Steven Bernstein, offering a ripping reimagination of Duke Ellington’s iconic Newport piece, “Diminuendo and Crescendo in Blue.” Corea, bassist Christian McBride, and drummer Brian Blade (part of Jones’s “jazz” band) played post-bop with fleet, lyric transparency. Trio the Bad Plus (augmented by cornettist Ron Miles, alto saxophonist Tim Berne, and soprano saxophonist Sam Newsome) reprised their interpretation of Ornette Coleman’s 1972 album “Science Fiction,” which they performed in Boston last year, conveying the mix of folk-like delicacy and anthemic declamation in Coleman’s melodies. Perhaps the best moments, however, were those of quiet collective improv. Coleman’s music, it turned out, is another context in which these musicians can be themselves. Closing the day, singer Gregory Porter delivered his churchified soul jazz — another kind of political statement. This weekend was supposed to be the swan song for impresario George Wein, who cofounded the festival in 1954 and has announced that he will turn over production to lieutenants Dan Melnick and Jay Sweet, with bassist McBride as artistic director. But seeing Wein, 90, shuttling from stage to stage in his golf cart, it was hard to imagine him bowing out completely. Jazz is his context, too. Jon Garelick can be reached at jon.garelick@globe.com. Follow him on Twitter @jgarelick.